We make money, spend money, save money, but have you ever thought about the actual dollar bills themselves? According to TitleMax, the nation’s largest title lending companies, there are about 11.7 billion one dollar bills in circulation in the U.S., 8.9 billion 20 dollar bills and 11.5 billion 100 dollar bills. 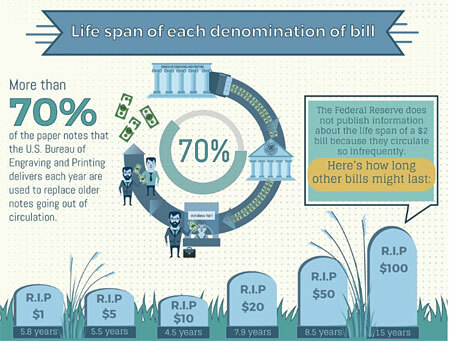 The Miami accounting professionals learned that every dollar bill has a life cycle, with old notes making place for new ones. For example, a 10 dollar bill is replaced every 4.5 years, while a 100 dollar bill takes 15 years to get out of circulation. Coins, on the other hand, are replaced every 30 years. Since the 1 dollar bill is the highest in circulation in the U.S., the Miami accounting professionals decided to share with you some of the secrets around the currency. Did you know it takes nearly 6 years for it to be replaced? The one dollar bill is that it’s not made out of paper. Shocking, right? The currency is composed of 75% cotton and 25% linen. Another secret of the one dollar bill is that it only costs 5.6 cents to produce. The Federal Reserve says it’s the least costly bill to make, compared to the 13.2 cents it takes to create the one hundred dollar bill. The Miami accounting professionals, thanks to MSN, learned the design for the one dollar bill hasn’t changed since the early 60s, most likely because it’s the least counterfeited bill. 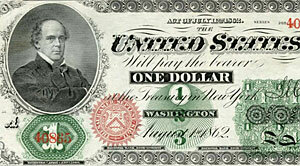 During the Civil War, the first one dollar bill featured Salmon P. Chase, Secretary of the Treasury, not George Washington. And as far as the seal that’s on there, it took six years for Congress to approve it. Setting aside history for a minute, Miami accounting professionals reveal probably one of the most shocking secrets about the one dollar bill: It’s home to many things. In a 1994 study, 94% of 68 one dollar bills that were tested had bacteria on them, including germs that can cause pneumonia and other infections. The bill is also home to drugs. 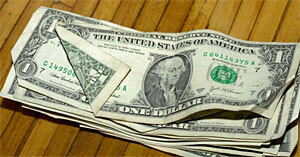 That’s right, nearly 80% of one dollar bills have traces of cocaine on them. Some even hold traces of methamphetamine and heroin. Did you know you can actually track your one dollar bill? The Miami accounting professionals found out you can know track where it’s been before it landed in your lap, by submitting a serial number on the Where’s George website. You can literally see the journey that one dollar bill has taken, the cities, states, even countries it has travelled to. Additionally, the first letter of the serial number will reveal which bank issued the bill. For example, if the tracking number starts with an A, the note comes from Boston. If it’s D, the one dollar bill comes from Cleveland. G is Chicago and so on. Plus, it you see a star by the serial number, you’ll know it’s a newer bill that has replaced one that’s gone out of circulation. The 13 colonies, also known as the Thirteen British Colonies, who declared independence and formed the U.S. in 1776 are represented everywhere on the design of the one dollar bill. There are 13 arrows in the eagles left talon; on the Great Seal, you’ll find 13 stripes, and the pyramid has 13 steps. Even 1776 is represented by the roman numerals of MDCCLXXVI at the base of the pyramid. Just another secret of the one dollar bill. Who knew the one dollar bill had so many secrets behind it! 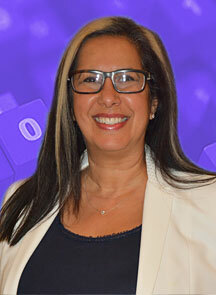 For help on how to manage your money, all the Miami accounting professionals at 305.868.7620.